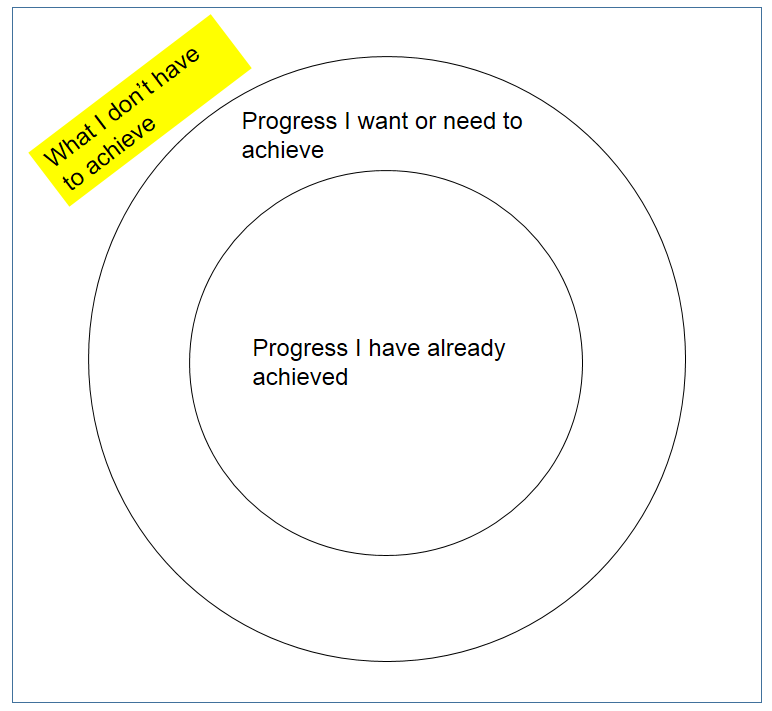 The progress-focused circle technique is getting more well-known and popular. It works like this: the coach draws two circles on a piece of paper or on a flip-over sheet, an inner circle and an outer circle. On small post-it notes clients write down what progress they have already achieved and then they hang them in the inner circle. Next, clients write on post-it notes what progress they further need and/or want to achieve and they hang these in the outer circle. Finally, clients choose which note(s) they first want to be able to move from the outer circle to the inner circle and how they will try to accomplish this. On the first day of a training I gave to a group of teachers I explained the circle technique and invited them to experiment a bit with it. I also gave an example of how I had once used the circle technique with a client of mine. What was interesting in that situation was that my client had not only hanged post-it notes in the inner and outer circle but also outside of the outer circle. He explained: "I won't be able to achieve those things anyway!" The fact that he hanged a few post-it notes outside of the outer circle I found somewhat surprising but it did not form a problem in any way. Shortly after I had coached him he achieved a terrific result. On the second day of the training the teachers who participated in my training told me what they had tried out and had found useful. Several participants mentioned the circle technique. One teacher had used it in his classroom. At first, his students had responded slightly reserved. One of them asked: "What kind of game are we going to play now?" But when they got going the process became useful. They enjoyed to see what they themselves and their classmates had already achieved and they also found it useful to get a much clearer idea about what they still needed to do. They left the classroom quite satisfied. Another teacher had also used the circle technique and she also had found it useful. She had used it as a self-coaching tool. She, of course, had first written down what she had already achieved in the inner circle. Then, she had written several things in the outer circle which she needed and wanted to accomplish next. In addition to this, she had also, just like my client in my example on the first training day had done, written a few things outside of the outer circle. She said that this may actually have been the most useful thing of the exercise: "There, I wrote some things of which I decided that I, for the time being, did not have to do anything with. It relieved me to be able to put those things beside me and to focus only on the things that were in the outer circle." I find this a very interesting thought. In order to have a clear focus it not only helps to know what you want to focus on but also what you don't have to focus on. Those latter things can be written outside of the outer circle. What a relieve! Hi Coert! I find this circle exercise very interesting. I want to know a little bit more about it. The first guy you mention, told that he did not believe, he can be able to achieve it. The last teacher placed the post-it notes outside because she did not have to achieve it. I see a little difference between these two ways to use the exercise. In the first example it is BELIEVE and the other it is DON'T HAVE TO. I think the coaching process is a little bit different afterwards the exercise. Thanks for great blog! You are right, that is a difference.so what is outside of the outer circle may be of different categories such as: 1) don't want to, 2) don't have to, 3) not able, etc. This is interesting to reflect on some more. In the case of my client, by the way, the interesting case was that his beliefs about his abilities changed as we worked. What happened in this case was that I helped a student during three long sessions on three successive days to prepare for his math exam which he had flunked before. On this exam his graduation depended. During these three days his sense of competence grew step by step. A few (but not all) of the things which had originally hanged outside of the outer circle ended up in the inner circle after all. At the end of the three days, the day before his exam would take place there were lots of notes in the inner circle. A small minority of the notes were still in the outer circle and (I believe) there were still two outside of the outer circle. Looking at the circle I felt convinced he would achieve the highest possible score but that he would certainly pass the exam. And he did. Thanks for your explanation. I will try to experiment with this exercise with my future clients. I which part of the sessions do you use it most? I think it could be very good to use when you have had a few sessions. Hi Kenneth, You can use the circle technique whenever you want. Right at the beginning of the coaching or teamcoaching.